Looking at a box score is something anyone can do. Who lead my team in scoring? How’d we shoot from the field? And while that knowledge is useful, does it really earn you bonus points around the water cooler? That’s why I’m here. I’m bringing you the S.W.I.M: Statistics Worth Increased Media. Let Joe from accounting regurgitate what he heard on the way in this morning; you’re better than that. Use these nuggets to gain a unique perspective about last night’s Spurs/Lakers game. Over his last five games against the Lakers, Tony Parker is shooting 64.7% from the field while averaging 19.8 points (a 15.8% increase over his career average). The "aging" Spurs are scoring 112.8 points per game during that stretch. This was the first road game in over five weeks in which Parker grabbed more than a single rebound. 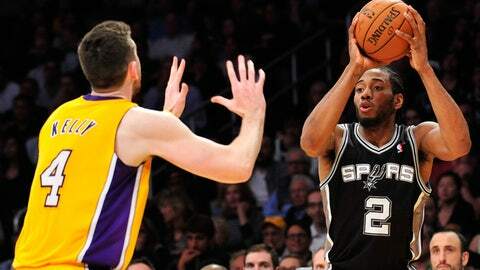 Kawhi Leonard’s first double double of this season came against the Lakers on the first day of November. Since that game, he has connected on a three pointer in every one of his double doubles. For the second time in two seasons and the first time since January 11, 2013, Tim Duncan grabbed at least 15 rebounds without scoring at least 15 points. Duncan took ten shots from the field, the fifth time in as many games he failed to take more than that. Prior to this run, his longest such streak was three games this year. Tiago Splitter blocked three shots in this game after blocking a total of two in his last five games against Los Angeles. Danny Green is making two-thirds of his three pointers during his last four games in which he tallied at least 20 minutes. The 76ers have the worst scoring defense in the league, surrendering 110.5 points per game. If the Lakers shut out the Grizzlies tomorrow night, they will still be giving up 111 points per game for the month of March. Kent Bazemore has more steals in his 13 game Laker career than he had FTM this year for the Warriors (43 games). For the fifth time in nine games, at least half of Bazemore’s points came from behind the arc. Xavier Henry is averaging one shot every 99 seconds over the last week. Kendall Marshall has scored fewer than ten points more often than not this season, yet he is a perfect 3/3 when it comes to reaching double figures on the 19th of the month. After winning two games in a row, the Lakers have lost four in a row by an average of 25.3 points when Wesley Johnson does not attempt a free throw.